Edited by: Robert Davis Jr. 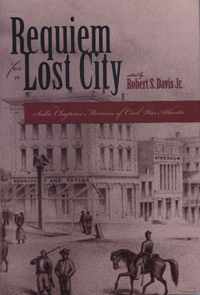 Through novels such as Gone with the Wind, the story of the fall and destruction of Atlanta has joined myths of other lost cities such as Atlantis, Troy, and Jericho. Sallie Clayton's memoirs show us the reality of Civil War Atlanta from Secession to the memorials to the fallen, many years after the war. Interestingly, Margaret Mitchell's heroine was about the same age as Sallie Clayton was during the war, giving us the opportunity to compare Sallie's witness to the legend. Sallie was a member of one of Georgia's wealthiest and most prominent families. Her memoirs detail the losses her family suffered. Moreover, Sallie seems to have been in all the wrong places throughout the war. Her misfortune is our good luck, however, because from her we have a first-hand account of war-torn Atlanta, plantation life during the war, the opening shots of the battle for Chattanooga, and of postwar riots in Augusta and Athens.